In case you’re wondering why Sir Roger is this week’s chosen one, there is good reason although you may want to sit down and fix yourself a glass of the strong stuff. Believe it or not but this Sunday, Sir Roger will celebrate his 85th birthday. Eighty-blinking-five. Makes you feel old, doesn’t it? Quick, pour yourself another drink. 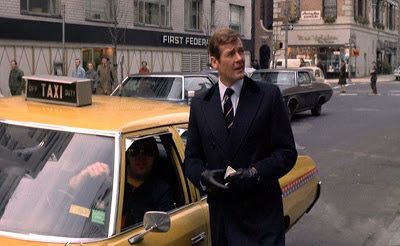 Every inch the archetypal English gentleman, Sir Roger was the ideal person to play Britain’s most well-known spy, doing so in seven James Bond films. Of course, he had the perfect education leading up to it – firstly, studying at the Simon Templar School for Saints before advancing to the Sinclair and Wilde Anglo-American College of Persuaders. 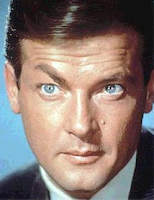 His Bond portrayal was quite an influence on my eight-year-old self who watched wide-eyed as he saved the world from megalomaniacs while surrounded by ladies with an aversion to wearing clothes. That’s not to mention the underwater motorcar (sadly though, he’s the only Bond never to get behind the wheel of an Aston Martin). It has long been rumoured that the boffins at Lynx ‘acquired’ pheromones from Sir Roger to create its famous ‘Lynx effect’. Upon close inspection of the above photograph, one must believe there’s a ring of truth in it. Not many people could pull off a Safari suit as effortlessly as Sir Roger did in his first Bond outing, Live and Let Die. Sartorial standards were clearly set very high in this film as he also wore a rather dashing Chesterfield overcoat as he trod the uncompromising streets of Harlem. Even when he’s not playing Bond, Sir Roger remains a preening peacock, with lots of eccentric flourishes. He also has a sense of humour to match, happy to send himself up in Cannonball Run. 001) His father was a policeman. 002) He’s never worn jeans. 003) For a short time, he resided in Radcliffe in Bury, Greater Manchester (on the same street that I briefly lived). 004) His 007 contract provided him with an unlimited supply of Montecristo cigars during filming, typically running into thousands of pounds. 005) He didn’t perform any of his own stunts in Bond. 006) In seven Bond films, he never ordered a Vodka Martini (shaken, not stirred). Happy birthday for tomorrow, Sir Roger! How do you suppose he mastered his fear of firearms to act in all of the gun scenes he's done over the years?! Thank you for the kind comments you've left me recently on my blog, I have been trying to get in touch for a little while but sometimes I can't comment on other people's blogs, there's a glitch somewhere in blogger responsible for it I'm sure! That's quite alright, Porcelina - I'm not finding Blogger to be the easiest of things to get to grips with. Snags ahoy! I was equally perplexed about the fear of firearms factual nugget, especially as Sir Roger served in the forces too. Apparently it caused countless retakes during such scenes when crossfire was involved. I suppose that it only goes to shows the kind of chap he is! Not my fav Bond tbh- I'm more of a Sean or Daniel girl but agree about the suaveness.... I also have problems commenting if I'm using my phone- but works fine on the old laptop. I have such lovely memories watching Moore on a rainy bank holiday and the tongue-in-cheek way he delivered his lines. My favourite Bond is undoubtedly Mr. Connery though. Anybody who can pull off a baby blue towelling playsuit as he did in Goldfinger deserves that accolade. I am still tinkering about with it but should be up-and-running on the old Twitter this coming week. I will electronically follow you then, Susie with immediate haste.